I have read DJ Times for many years. It is my favorite magazine and contains a wealth of information about the mobile and club DJ scenes, along with inspiring artist interviews. Past issues of DJ Times have featured some of my favorite DJs, including Grandmaster Flash, Paul Oakenfold and DJ Dan. The cover of the January 2011 issue, in which the article "DJ Takes Stock in Wedding Market" appeared, was graced by Dutch trance DJ Ferry Corsten. Ferry is an all-time favorite, and several years ago I caught his late night closing set at Space in Miami. 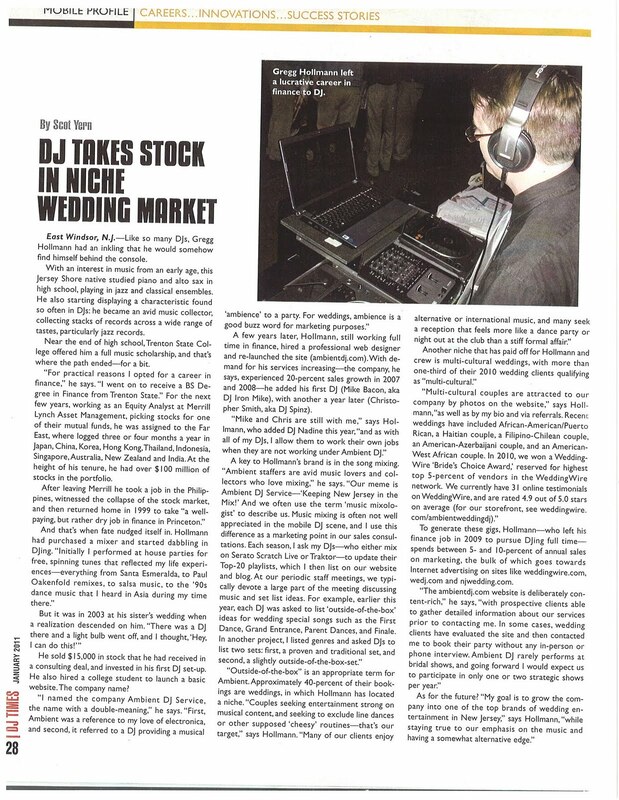 To request a larger print of this article, please contact gregg@ambientdj.com.